Why wait until 2020 for ULEZ? The Freight Transport Association (FTA) has highlighted concerns over the timescale for the rollout of the new Ultra Low Emission Zone (ULEZ) in London and has raised the question of why businesses and residents in the capital must wait until 2020 for the scheme to begin? Designed to considerably improve air quality within London in the future, ULEZ will require all vehicles entering the capital to comply with strict new guidelines regarding their CO2 and NOx emissions, with failure to do so resulting in additional costs for vehicle operators. At present, figures supplied by Transport for London (TfL) show that approximately 4,300 deaths per year can be attributed to air quality-related illnesses in the capital and therefore any measures to reduce this figure in the future should be brought in as soon as possible. Indeed, London is currently in breach of legal limits for air pollutant levels set by the European Union and therefore a failure to implement new measures to incentivise greener cars in the city could see the government faced with fines or other sanctions in the years ahead. One stumbling block to the rollout of ULEZ right now though could be a lack of compliant vehicles with the new stricter emissions guidelines and the associated costs of investing in new, greener models, especially within the UK haulage industry. However, FTA head of urban logistics and regional policy Christopher Snelling argued that many haulage providers are already utilising vehicles that are compliant with Euro VI guidelines, meaning they offer class-leading emissions performance and are far cleaner to run than their older counterparts. It is therefore feasible that ULEZ could be introduced far earlier than the present timeline of September 2020, as this would encourage logistics providers to either invest in new lower-emission vehicles or transfer their existing Euro VI-compliant vehicles to operations within London – both measures that would ultimately benefit inhabitants of the capital. "Offering a discount for Euro VI commercial vehicle could help ensure that fleets speed up the purchase of newer vehicles and move these cleanest vehicles to the capital today, giving those living and working in central London many of the benefits of the ULEZ right now," Mr Snelling noted. 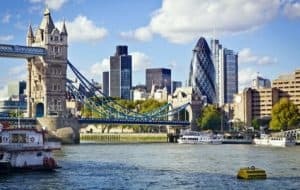 Furthermore, apart from the current Congestion Charge for vehicles entering the Greater London area, there are no initiatives specifically designed to promote cleaner car use in what is one of the most polluted cities in the UK right now. As a result, speeding up the programme to roll out ULEZ would provide a further incentive for all road users to clean up their act and invest in lower-emission vehicles that will ultimately deliver key environmental and health benefits both for London residents and for the nation as a whole. Indeed, the introduction of ULEZ would work in much the same manner as the Congestion Charge does today, with a series of set costs for vehicle operators entering the ULEZ area based upon Euro emissions standards and broken down by vehicle type. It is a concept that both the public and members of the logistics industry are accustomed to and could be set up with a minimum level of investment from TfL. "Public authorities sometimes seem to only wish to pursue their aims via increased regulation and cost for business," Mr Snelling concluded. "The FTA believes that there should be a more balanced approach, with positive measures to support industry in improving quality of life, also used." With this in mind, TfL has announced the launch of a new consultation into the rollout of ULEZ that kicked off on October 27th and is running until January 9th next year. It will examine the long-term benefits of a reduction in air pollution for London, as well as the associated costs and benefits for road users, members of the public, businesses and residents. Guidelines for ULEZ compliance are also being discussed in the consultation, including the measure that all taxis and new private hire vehicles in operation in the capital be zero emission-capable from 2018, as well as a reduction in the age limit for all non-zero-emission-capable taxis from 2020 from 15 to ten years. A full disclosure of the results of the consultation will be made next year and it is perhaps then that many of the questions surrounding the need to wait a further five years before the scheme's initial implementation will likely be answered.